Experience video calls that are the next best thing to being there in person with this 1080p HD webcam. 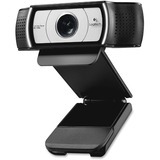 Optimized for Skype for Business, this webcam supports H.264 with Scalable Video Coding and UVC 1.5 encoding to raise meeting productivity with remarkably clear video at all times, even when bandwidth is limited. 90-degree field of view, pan, tilt, and 4x digital zoom allow you to adjust the frame to fit your environment. RightLight 2 technology and a precision lens provide sharp video even in low-light conditions. USB plug-and-play connectivity makes this webcam simple to start, and easy to operate. Just connect to any video conferencing application, including the ones you already use.